I love me a grain. What I don't love is my overdependence on refined wheat. As I have mentioned before, I have snapped up gluten-free cookbooks not because I am gluten intolerant, lord no. In fact, I love gluten--what, with its pleasing protein elasticity that makes my breads rise in a light and poofy way. However, I want said cookbooks because they push me out of my comfort zone and into the world of amaranth, millet, teff, quinoa, wild rice. 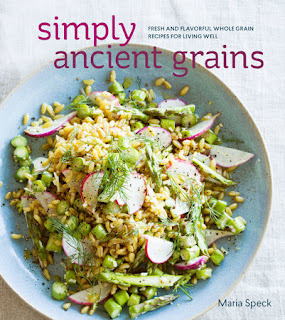 What is downright delightful about Maria Speck's new cookbook, Simply Ancient Grains, is that she sets up a parade for all of the gluten-free grains to attend, and the ensures that those wonderful whole grains that have gluten (such as barley, rye, bulgar, farro, freekah) all have a place in the marching band. Simply ancient grains is Speck's sophomore collection, following her delightful debut Ancient Grains for Modern Meals, which was published in 2011 and gifted to me that year by one of my fathers-in-law (he has great taste in all kinds of books). While I have cooked from the book often, I have posted only once, which is a travesty given how tasty the results of Speck's labors turn out to be. In both books (but I would say particularly in this new offering) Speck takes the fear out of cooking with whole grains--she presents each recipe thoughtfully, often giving make-ahead tips and alternatives, especially if the grain is a gluten-containing one. Offering multiple ways to go about using her book, Speck suggests that you can do what one often does with a cookbook: open up to a page, get excited, and start cooking. However, she also provides a handy chart with the grain listed in the left column, and then in the right column she lists all of the recipes that use that grain. Such an organizing principle is helpful if you're gluten intolerant and want to avoid, say, rye. However, it is super-handy if you happen to have purchased a big bag of Bob's Red Mill rye berries, and you need to use it up. Further, what I love is the different roles grain plays in Speck's offerings. Sometimes it is front and center, like the Kamut Spaghetti with Saffron-Infused Tomato Sauce or the Red Rice and Beet Cakes with Honey Mustard. Other times, it plays a more supporting role, such as the Chicken Stew with Honey-Balsamic Squash and Farro or the Roasted Eggplant with Tomatoes, Spelt, and Mozzarella. Oh my. Time to get cooking. It seems only fitting that I got my hands on Speck's cookbook now. As I mentioned, I am reading Dan Barber's The Third Plate, a fascinating investigation of modern-food. Barber laments the farm-to-table movement not because he doesn't agree with it (in fact, as owner-chef of Blue Hill at Stone Barns, he heralds local, sustainable agriculture and appears on the surface to be one of its poster boys); instead, he argues that the farm-to-table movement is one where chefs and consumers cherry-pick only certain rarefied and highly desirable ingredients, thus leading to the decline of a whole host of others that are highly important to our ecological systems. The farm-to-table movement--while laudable--will only diminish our food supplies if we don't also seek out the humble kohlrabi, the knobby sunchoke, the malaligned mullet, or the much misunderstood spelt. Whole grains, particularly whole wheat in its many varieties, fall into that category of the oft-overlooked. In fact, in whole sections of his book, Barber details our aversion to whole wheat and explains why we desire white flour--it is sweeter than whole wheat, and we have a powerful preference for the quick energy that sugars provide. Further, the bran in whole grains, with its sharp edges, slices and dices the gluten, making it less elastic and often leading to denser, heavier breads that smack of the sanctimony of the hearty whole grain bricks, I mean breads, of the 1970s. Barber argues that sustainable foods have to taste good before anything else, or we're not going to eat them. Thus, the sweetness and the fluffiness of refined white flour acts as a siren call to consumers. Barber argues that we need to be better cooks in order to revitalize these seemingly less desirable products, get more closely connected to our grains especially through soil conservation and selection of ancient grains that have more flavor, and (now this one seems the most remote to me right now, but perhaps....) mill our own flours in order to preserve the amazing-tasting oils. Don't get me wrong, I have my qualms with this book. Barber is a little rarefied himself to hint that we all have time and access to these things; however, I do think that if more people push for a wider selection of not only ancient grains but diversity within a particular grain, well, we'd all be better off for it. For me, my own thinking is that I don't eat only one kind of fruit. I don't even eat just five kinds of fruit. Thus, it seems desirable to diversify the kinds of grains I eat as well. And what's delightful is that Speck's book can help us tackle these grains that have baffled us when we're facing a wall of grain bins in the bulk section of the grocery store. Okay, let's get back to the actual cooking, shall we? Page 215 boasts a beautiful polenta tart with plump plums layered atop it. How could I resist, especially since we're smack in the midst of plum season (and a friend of mine is even bringing me another bag of plums today when we meet for coffee--luckily I have another plum-focused recipe in the hopper!)? And what a fantastic and unusual dessert this is. Polenta for dessert you say? Indeed, polenta puddings and cakes and even streusels abound out there. 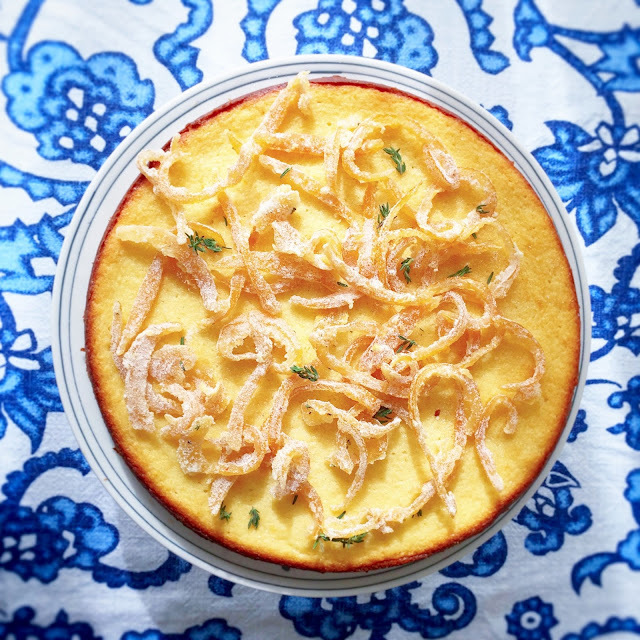 Polenta can be simply cornmeal, which is what I used, or it can be the more coarsely milled grits. You can choose your corn, regardless of what the bag says. Cornmeal is ground, dried corn. Grits, on the other hand, are often made from hominy--which is corn, but it has been treated with an alkaline solution to remove the hull. Polenta is generally a more coarsely ground (than cornmeal) corn, but medium or coarse ground cornmeal will do you just fine. (Click here or here for a more exhaustive look at the difference between cornmeal, grits, and polenta). When combined with butter and herbs, polenta makes a scrumptious dinner, but throw in some honey and, whoo boy, this is beautiful. I almost wanted to eat the whole bubbling pot, but I restrained myself, allowed it to cool into a cake, and then baked it once again. Indeed, I was well rewarded. Further, the topping and the compote are worth a mention. While it is true that almonds are nuts non gratae around these here parts of California due to the drought, I happened to have a jar full of them. Combined with honey and butter, they are delightful--Speck suggests that you use sliced almonds instead of whole almonds. While such nuts might make a prettier presentation than my own, I liked the rustic nature of the irregularly broken nuts (I put the whole nuts in a towel and beat them with my meat tenderizer--voila, crushed nuts). And I would be remiss if I did not mention the plums. What a revelation: dusty cinnamon and vibrant thyme combined with the bitterness of plum skin and the sweetness of plum flesh. Oh my. I do think that the compote is perhaps a little too generous for the tart. What a shame--I'll have to put some on my oatmeal later this week. Sure, sure, you could serve this as an after-dinner treat, but I guarantee it's just as good for breakfast the next day. I know. Thus, in sum, this lovely cookbook came my way at just the right time. I can't wait to tear into more recipes. Did someone say einkorn? Note: I used stone-ground medium cornmeal for this recipe. You can also use whole grain polenta grains (Bob's Red Mill makes them, which they also call grits). If you use these polenta grains, you can cut the final cooling down to 20 minutes. 1. To make the polenta: Add the water, milk, honey, and salt to a heavy saucepan, and heat over medium-high heat until just simmering. Slowly add the polenta in a thin stream, while whisking. Whisk for 1 minute more, decreasing the heat to low as the polenta begins to bubble. Cover and cook for 10 minutes, stirring vigorously with a wooden spoon to prevent the polenta from sticking to the bottom of the pan. Remove the saucepan from the heat and let it sit, covered, for 10 minutes, stirring once or twice). 2. Butter a 10-inch tart pan. When the polenta has cooled for 10 minutes, pour the polenta into the pan, spreading it evenly with the back of a wooden spoon. Set aside at room temperature to cool and to firm up, about 45-60 minutes. Using a spoon, poke about a dozen holes in the polenta (which will keep it from swelling up when in the oven later). 3. Add the plums to a large bowl and sprinkle with cinnamon. Add 2 Tbsp of honey, the sherry, and 1 Tbsp of thyme leaves. Gently combine; cover the bowl and chill in the refrigerator, stirring once or twice. 4. About 90 minutes before you would like to serve the tart, preheat the oven to 400 degrees. 5. Add the butter and 1 Tbsp of honey to a medium skillet. Heat over medium heat, stirring occasionally, until the butter has melted and begins to bubble. Add the almonds and stir until they are warmed through, about 1-2 minutes. Immediately spread the almond mixture over the cooled polenta, using the back of a spoon. 6. Bake until small bubbles appear around the edges and the almonds have begun to turn a golden brown, about 20 minutes. Transfer the pan to a wire rack and allow to cool for 50 minutes before cutting (which will enable the polenta to set). 7. To serve, cut the tart into 8 wedges. Atop each wedge, spoon some of the compote and its juices. Garnish with a few leaves or sprigs of thyme and a dollop of cream, if desired.